At Renovare, we understand that your healing journey is all about relationships. We also know that dealing with the underlying causes of your problems takes a team to support you in truly getting well. We empower you to create a LifeStyle that fits your needs, desires, and genetic uniqueness. We help determine what you need and carefully measure to make sure your care fits your unique situation. We offer ultra-budget friendly options to more comprehensive care options – you are in control of each part of your care. Most people who come to Renovare for care have suffered for far too long with a long-list of chronic (over 90 days duration) health problems. Many are sick and tired of being sick and tired and unwell. Many have been to doctor after doctor with limited results – some even worse after medical care. Why does traditional medical care fail so often for those with chronic disease and health problems? Traditional medical care focuses on acute or crisis care problems that could be life-threatening in the short term. Our hospital Trauma care units, ER rooms, and Urgent care clinics are ideal for dealing with these life-threatening crisis care needs. This Acute Care Approach as described below has major limitations for those suffering with Chronic Disease. 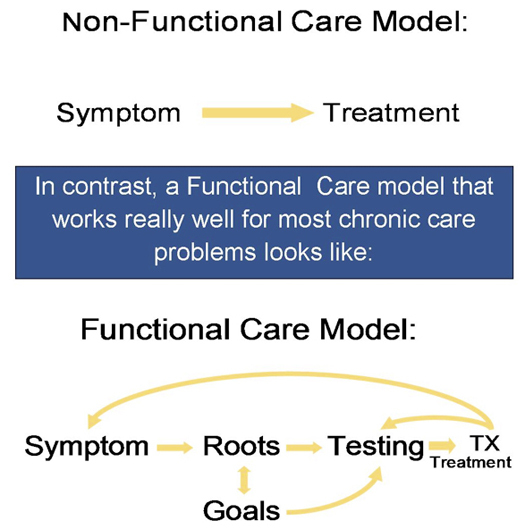 The bottom diagram shows the Renovare approach we have found effective for helping patients suffering with chronic disease. At Renovare, we don’t seek to treat or cure disease – acute or chronic. For someone with Anxiety, Asthma, Arthritis, Chronic Pain, Depression, or Autoimmune Disease, we are more interested in the person with the disease than the name of the disease. With Anxiety/Depression, as with most chronic diseases, if you have one hundred people diagnosed, you have 100 different diseases. Everyone is different with unique genetics, a unique environment and LifeStyle causes, and a unique manifestation of their body imbalance or disease. How did your chronic degenerative disease start and progress over the years? What kind of LifeStyle imbalances, toxic exposure, excessive toxic stress contributed to your downward slide? What are the likely roots (plural) behind the development of your diseases? What have you been missing to support your Natural Healing Response? In short, “Dis-ease” is really a body out of balance and a LifeStyle that does not fit our genetic needs. Most patients we see at Renovare start low on the Wellness Scale, usually somewhere between -5 and 0 on the scale. Goal one is to stop the slide towards -10 through dealing with the root causes of their problems. For many, their declining health is like a run-away train going down a mountain or a plane in a nose-dive. Next, we work to support changing direction to start climbing the hill towards Wellness. This involves changing LifeStyle to meet the unique needs of each patient. It involves learning and change for the patient combined with the mult-faceted treatment support we offer at Renovare. Lastly, as you achieve your personal Wellness goals – whether it be a +3 or a +9 on the Wellness Scale, we celebrate your success with you and end active care. We then offer maintenance care approaches for those who desire to stay at high-level Wellness over time. Stress management, irritability, and feeling overwhelmed. Mary came to our clinic recently and shared her story. She had developed sores on her inner ankle that progressed to an open wound. Since she didn’t have insurance, she tried home treatments – no luck. Next, she went to a medical physician (trained in acute disease care). He ran tests and tried antibiotics – no improvement. The wound progressed to a deep pocket – you could insert 3 fingers into it! Her MD referred her to a specialist and again more (acute care) tests – could not figure it out. Guessed at a diagnosis and sent her to yet another specialist. More (acute care) tests and not sure what it is. Mary had now burned through over $10,000.00 of her precious savings with no answers and little help! She is faced with losing her home and declaring bankruptcy with her medical bills overwhelming her limited savings. Sadly, I hear this type of story time after time. What went wrong with our medical disease care system for Mary? Almost 80% or our health care problems in America are now CHRONIC disease care problems. Guess what kind of training our medical physicians in America receive? That’s right, virtually no training for CHRONIC disease. Chronic diseases are those that last over 90 days. TV shows like E.R. portray the heroic efforts of our medical professionals saving lives with amazing trauma care surgery and miraculous medications. Guess what kind of condition Mary had? She was suffering with a chronic autoimmune disease for which her doctors had little training or even the tools to help her. Repeat this for almost 80% of our health problems – chronic disease – and we have an expensive mess! So What Is Wrong With Our Medical Training? The inadequacy of clinical education is a consequence of the failure of health care and medical education to adapt to 2 related transformations in the past 50 years that are central to good health care today. In the first, chronic disease replaced acute disease as the dominant health problem. Chronic disease is now the principal cause of disability and use of health services and consumes 78% of health expenditures. In the second, chronic disease dramatically transformed the role of the patient. Dr. Halstead writes that we need a new medical training approach for physicians to help those with chronic (long-standing) health problems. The acute care (emergency-room) model of health care in ineffective and far too costly for most of our chronic disease problems. In the book, “Living a Healthy Life With Chronic Conditions”, co-written by Dr. Halstead, the approach is to teach people to manage their chronic disease – whether it be heart disease, diabetes, arthritis, or asthma. Since our medical providers are trained in only the acute care approach, they tend to view each patient through the lens of the acute care model. This is great for acute care problems, but what about chronic disease? If the only tool you have is a hammer (acute care) you tend to see every problem as a nail. Far too often, the “hammer” of acute care treatment with powerful drugs and surgeries is used for chronic disease. This is like using a hammer to loosen a delicate Phillips-head screw – not effective and likely to cause more harm than good. Our body is an amazingly complex, delicate biologic system. With chronic disease, we need sensitive treatment approaches to help shift this delicate system towards balance and Wellness. Using powerful drugs is like trying to use a hammer to kill a fly on a window. The heavy hammer is awkward and likely to miss – and the window pane is likely to suffer more harm than help. Acute care “hammers”are simply the wrong tool for the job. Another problem is that we expect our medical doctors to be experts in everything. Dr. Alex Vasquez, a brilliant lecturer, author, and “triple Doc” – Chiropractic physician degree, Naturopathic Medical degree, and now a Osteopathic Medical Doctor degree – was describing his recent experience at a highly rated medical school as a 4th year medical student. His medical school professor came into the class and stated that, “Diet, nutrition, and lifestyle are profoundly important in health and disease”. His professor then moved on to the next subject regarding pharmacology (study of drugs). That was the extent of his training regarding diet, lifestyle and nutrition in Medical School. Without exception, my medical physician colleagues tell me they got “zippo, nada, nothing” regarding effective training in diet, nutrition, vitamins, or lifestyle. Expecting our medical physicians to be experts in these areas is unrealistic – they are experts in pharmacology – as we need them to be. My MD colleagues and friends tell me that they often feel frustrated and ill-equipped for the chronic disease patients they see – they dread it, but are expected by their employers and insurance contracts to write a prescription and move on. This helps to explain why medical providers sometimes do things that don’t make sense (and harm more than help) for those who struggle with a list of chronic diseases. With few exceptions, my medical colleagues are highly trained, dedicated, caring professionals who provide the essential acute care when we need it. Asking these medical professionals to treat chronic disease without the needed training or tools isn’t fair to them or to their patients. Would you expect your dentist to do your dental care with gardening tools? The far too few MD’s who do have training and experience in treating chronic disease have pursued this training on their own – often at great expense and risk of criticism from their peers. I applaud these courageous pioneers who are way ahead of the curve. This is called linear thinking. This approach is limited to acute care problems. A comprehensive treatment process to deal with ALL of the root causes. This is what we teach, do, and excel at to help each patient we serve at Renovare Wellness By Design. You diet and exercise and it just doesn’t work anymore – Why? The myth that cutting calories drops weight is a myth – Why? Some people eat LOTS and stay lean and fit – Why? It’s all about your METABOLISM or how efficiently you convert food to energy. So fixing your metabolism is essential if you struggle with staying lean and fit – easily. I have seen patients who valiantly exercise and exercise and are barely managing. Patient after patient comes to me upset about weight gain even after dieting – they are ready to give up. So what is the solution? Chapter 1 of the book “7 Secrets to Wellness” by Dr. Gerhart goes into depth on how to do repair your metabolism – effectively, safely, and naturally. This is part 1 of a 5 part series of e-mails on this topic with the rest to follow. The person on the left has lost the same weight at the person on your right. What did they lose? Healthy loss as shown on your left if almost completely fat loss while preserving muscle and organ mass – the source of much of your metabolism. The person on the right has lost most of her weight by losing precious muscle and organ mass. Do you really want your organs like your kidney, heart, and liver shrinking through destructive weight loss? The person on the right has not an ounce to lose. We commonly see patients with body fat stores that exceed and sometimes even double their critical muscle and organ mass. Their metabolism is damaged and unless we help them repair their metabolism, they are doomed to worsening weight gain (as fat) and continued muscle/organ mass loss and declining health. 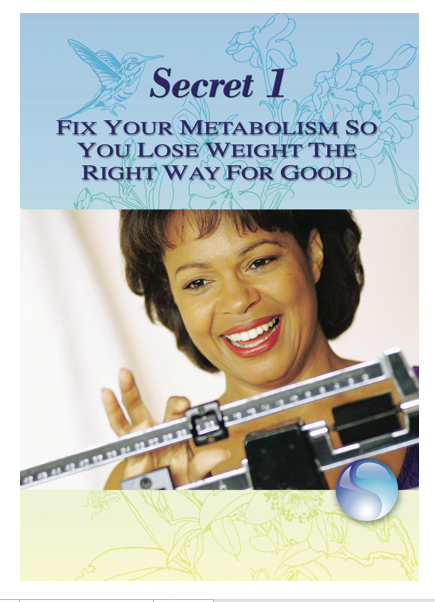 In next e-mail in this series you will learn more about your metabolism and how to start repairing it. ICW = Intracellular water. This reflects your metabolism and how well your mitochondria (cell energy factories) generate ATP (cell energy) to power the pumps that move nutrients and water into your cells and power the detoxification pathways (Chapter 7) to process and move toxins out of your cells. When this works well, your cells are plump, happy, and youthful – and you are thin, fit, and energetic. When this works poorly, your cells are shriveled (raisen-like), sickly, and toxic – and you are fat, bloated, and toxic. 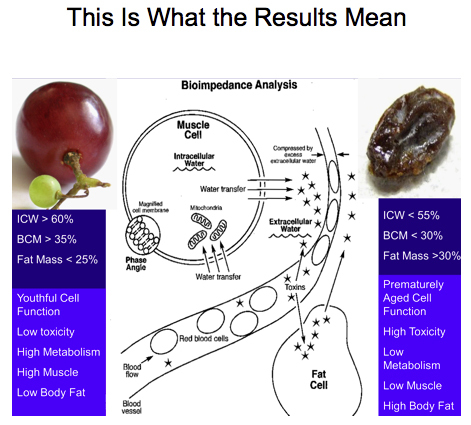 BCM = Body Cell Mass (Muscle and Organ tissue rich in mitochondria that power your metabolism). When you are repairing your metabolism, this goes up. This is the best measurement of healthy aging. When you lose weight, you must guard against losing this! Fat Mass = stored energy at 3500 calories per pound of stored fat. Fat is not bad, it is stored energy. Rather than get upset with our fat, let’s ask why we aren’t burning it. If you have excessive body fat, it is a metabolism problem, not a fat problem. When you are successfully repairing your metabolism, you lose only fat and maintain your precious muscle, mitochondria and metabolic tissue (BCM above). By doing follow-up Body Composition and Metabolism Assessments at intervals of 2-4 weeks during a Metabolism Repair program, we can assess your progress, what you are losing, and if you are becoming toxic because of fat loss. Next e-mail in this series we will explore “Repairing Your Metabolism”. 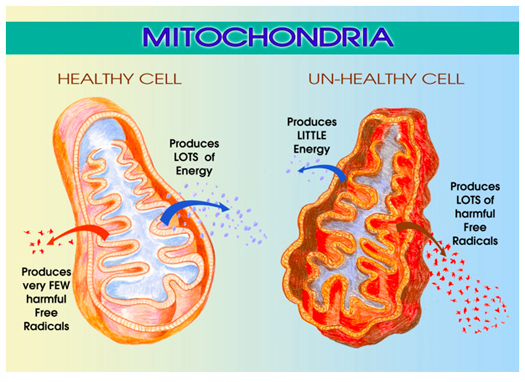 What do you notice as different between cells that have healthy vs. unhealthy mitochondria? In unhealthy mitochondria we don’t make enough energy to repair and build muscle and organ mass and bone etc. Instead of converting food to energy, we make fat and harmful free radicals. This leads to excess inflammation, pain, fatigue, immune problems, skin, nail and hair problems and accelerated aging. So to repair your metabolism, you must supply your mitochondria with plenty of the “good stuff” and get rid of most of the “bad stuff” so your mitochondria, metabolism, and body can heal and move toward high level energy, vitality, and Wellness. Emma had low stomach acid and leaky gut problems so we helped her with stomach acid and digestive enzyme support that fit her needs. Emma had IgG and IgA food allergies (delayed food allergies that can create virtually any symptom – or just mess up our metabolism) to the dairy protein found in cow’s milk, butter, cheese, yogurt, and ice cream. She also is reacting to wheat and the other gluten containing grains (rye, barley, most oats) and to cane sugar. 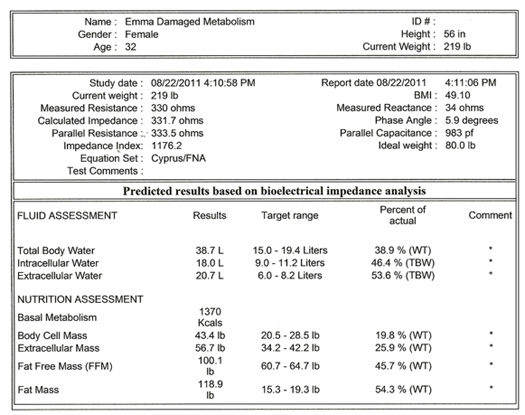 Emma had medium high levels of lead and mercury on post-chelation challenge toxic heavy metal testing. Emma had real low energy in her acupuncture energy meridians that power her digestion and metabolism. Emma had low levels of magnesium, vitamin D, zinc, iodine, and was not eating or absorbing enough protein. Read labels – if you can’t pronounce it, don’t eat it. Go light on the fruit – wild blueberries, organic strawberries, black berries, organic apples are the best of the fruits. Make sure you eat more far more veggies than fruit. Eat at least 5 times per day – 3 protein containing meals and 2 protein containing snacks. Get at least 6 servings per day of concentrated protein (15 gram servings) per day. Get plenty of healthy fats. You heard that right – good fats help our metabolism. Health fats don’t make us fat, refined sugars make us fat. Avoid breads, pastas, crackers, cakes, pastries, pies as much as possible. Keep a food log with someone to encourage and hold you accountable – for Emma it is her Renovare LifeStyle Coach, Nancy. She met with our Certified Personal trainer who did her strength, fitness, and flexibility assessment and created her aerobic, stretching, and all-important resistance strength program to build muscle. She is meeting with him for exercise training sessions 2X/week for the first 12 weeks to make exercise fun and create healthy habits. Her supplement program was designed to support her metabolism and healthy digestion. This will be revised in 4 weeks after her Body Composition and Metabolism re-testing and at 4 week intervals after to fit her changing needs. At 12 weeks, Emma had lost 10 pounds of fat, gained 4 pounds of muscle, lost most of the fluid that made her look bloated and toxic and doubled her energy level. The scale is showing improvement (least important as Emma has learned) and she needs smaller clothes – her waist line is reducing. Her mood, sleep, and enjoyment of life have improved more than she imagined possible. She is getting into the routine of her new LifeStyle and enjoying it. Family and co-workers are complimenting her and her new friendships that support her on her journey are rewarding, encouraging, and fun. She has a sparkle in her eyes and a spring in her step – she is getting her life back and realizes it. Emma is on track, full of hope, and REALLY encouraged! If you have failed and failed at dieting, you are not a failure. The problem is that diets don’t work – they lead to muscle loss and metabolism damage. Repairing your metabolism and creating a LifeStyle that fits your unique genetic needs is the only way to long-term success. Gaining muscle and metabolic tissue leads to effortless fat loss. Instead of dieting, it is essential to “feed” your metabolism so that you gain muscle and boost your metabolism. Chronic pain – pain that lasts more than 90 days – is a major problem in America. Most pain is directly linked to excessive INFLAMMATION. That’s why drugs like Advil and aspirin often help – temporarily. Inflammation is your body on fire. Arthritis, bursitis, tendonitis, gastritis, colitis, – they all share “-itis”. “itis” = inflammation. Many things cause inflammation. To start with, inflammation is your immune response to a threat in the environment – infection, allergen, toxicity etc. Where is most of your immune system located? That’s right – around your digestive tract or “gut”. In fact, almost 75% of your immune system is around your gut or digestive tract. This means we must start with your gut to track down the causes of your inflammation. 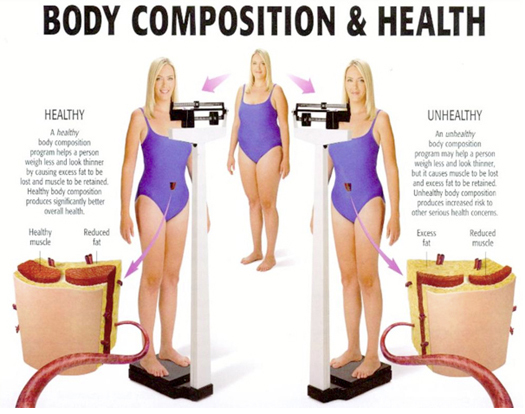 The graphic shows a healthy gut on your left and a “Leaky Gut” on your right. Leaky Gut is a foundational cause of inflammation. Repairing Leaky Gut is a process to be discussed in a follow-up e-mail. The Standard American Diet (SAD) is a start. Lots of processed food, huge amounts of sugar, fructose, and sweeteners, genetically modified foods creating allergy-related inflammation, and antibiotic and pesticide contamination all feed the fire of inflammation. Food allergies – especially the delayed or hidden IgG and IgA reactions. This means you eat your fast food meal and experience the inflammation flare 2-3 days later. If you eat this way typically, the inflammation never stops. Leaky Gut. 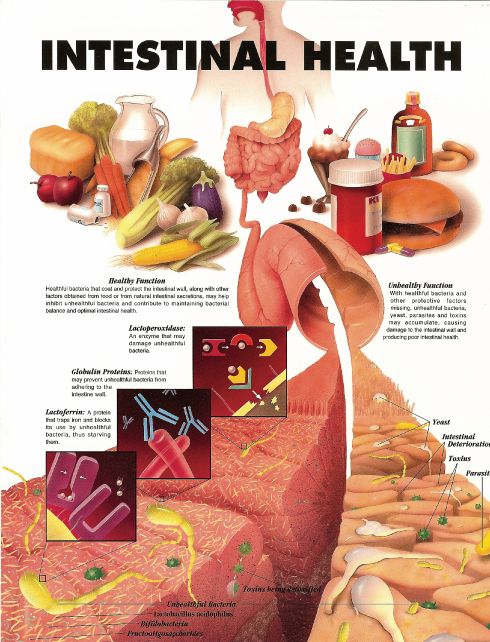 Antibiotics, junk food, inflammation, and excessive stress all damage the gut lining. This allows toxic “sewage” to leak into your blood stream creating all kinds of toxic inflammation throughout your body. Damaged Metabolism. Metabolism is creating energy and your microscopic mitochondria in your cells are the engines that make your energy. When they are healthy and balanced, you create LOTS of energy and very few harmful free radicals. When they are in trouble, you create less energy and more of the harmful free radicals that create LOTS of Inflammation. Problems with brain and nervous system balance. Think of this as toxic internal stress – like static on the radio cranked up day and night. This often interrupts sleep and rest leading to excessive inflammation. Spinal adjusting to rebalance your brain and nervous system, acupuncture, meditation, exercise, and supplements like magnesium are often highly effective. Nutrient deficiencies. Low Vitamin D is a common culprit since Vitamin D regulates inflammation. Low Omega 3 essential fatty acids, Magnesium deficiency, and many other nutrient deficiencies or imbalances contribute to excessive inflammation. Exercise deficiency or excess. Too little or too much exercise contributes to excessive inflammation. Toxin overload. Toxic chemicals and toxic heavy metals fuel excessive inflammation. Getting tested for these is important since we have effective, safe, and natural detoxification programs to help you detoxify and lower your inflammatory load. Your LifeStyle choices, more than any other factor, determines your levels of inflammation. This means you can change your inflammation and your health! Start to read food and beverage labels. If you can’t pronounce it, don’t eat it. The best food has no labels – the fresh stuff. Do a 30 day trial of dairy free and/or gluten free. Sound hard? It isn’t – the dairy and gluten free options at stores like Whole Foods and Sprouts are extensive. At the end of 30 days, you will likely feel better with less inflammation. If you want to feel even better, ask for help from your Doctor trained in Natural Medicine. Get your Vitamin D blood levels tested. The best test is a 25-OH Vitamin D blood test from Labcorp. Just ask our Doctors here and we will set up the budget-friendly blood test for you. Remove allergic/reactive foods – blood testing of IgG, IgA, and sometimes IgE levels with Blood Food Allergy testing is especially helpful. Skin scratch testing of little value for food allergy testing. Food allergies are almost always an issue –esp. dairy and often gluten allergies. Suppress excessive overgrowth of harmful yeast, bacteria, and viruses in the gut if needed. Start a safe, effective, natural parasite suppression or removal program if needed. Stomach acid – as we get older or become fatigued or sick, we make less and less. Nothing works without enough stomach acid to break down and absorb our protein, minerals, and vitamins. Stomach acid also cleans our food of dirty bacteria, yeast, and viruses. Lastly, stomach acid is needed to signal the valve at the top of our stomach to close properly (think heartburn and GERD), and trigger the release of our pancreatic digestive enzymes. Digestive enzymes – if needed after correcting stomach acid deficiencies. Important to pH-independent digestive enzymes if low stomach acid is a problem. L-glutamine, herbs, aloe extracts, and laser acupuncture all seem quite helpful to support repair. Supplying sufficient protein that is adequately digested to amino acids is also important to power the repair process. Prebiotics – like fertilizer, promotes growth of healthy bacteria. Probiotics – like grass seed, promote growth of healthy bacteria. Since we have trillions of bacteria in our gut, high potency probiotics that re-colonize the gut are important. Many brands are 2-4 billion actives per capsule. We now have professional grade probiotics at 100 billion per capsule which are especially effective in practice. To learn more , see the “So Why Different Probiotics?” section in Chapter 5 of Dr. Gerhart’s book available on Amazon entitled: “7 Secrets to Wellness”. For many, they have no gut-related symptoms at all! Far too many people have suffered far too long with chronic pain. Tired of addictive pain meds with a long-list of side-effects, many desperately need hope and help. At Renovare, we have worked for 30+ years to create a care process to help those who need “Hope and Healing for Those Ready for Wellness” which is our mission. The introduction of my book, “7 Secrets to Wellness” has more information if you would like to learn more. “7 Secrets to Wellness” is available on Amazon or at our clinic if you would like to learn more. An effective, safe, natural therapy that boosts cellular repair, metabolism, circulation, detoxification, and healing. Dr. Oz, “You don’t just feel better; you ARE better”. It is estimated at over 80% of all Doctor visits are related to excessive or toxic stress. Stress is one of the top health-related search words on the Internet. We all deal with it – often not well, sometimes overwhelmed. Why is this important? Almost all sufferers of complex, chronic diseases have an emotional component to their illness. Painful thoughts and emotions trapped in our subconscious mind can create all sorts of problems without awareness by our conscious mind. Bone loss and muscle/joint damage. exposed to sustained toxic stress. Sleep problems – difficulty falling asleep or staying asleep. Since poor sleep can double the risk of heart attack and stroke, this is REALLY important. Chronic pain, headaches, migraines and TMJ or jaw joint problems. The chronic muscle tension and nerve irritability from excessive stress set us up for a host of pain-related problems. IBS, Colitis, Crohn’s disease, Gastritis, Ulcers and a long list of digestive problems are linked to excessive stress. When our brain and nervous system go into the fight-or-flight stress response, digestion, detox, and tissue repair are shut down to divert all energy to surviving the crisis. Weight Gain and Damaged Metabolism. Prolonged elevation of the stress hormones including cortisol lead to insulin resistance. This leads to fatigue and fat gain especially around the belly. This leads to elevated inflammation damaging our energy producing mitochrondria leading to fat replacing muscle – a disaster for your metabolism. Don’t let stress affect your health anymore—talk to your doctor about ways to combat stress to keep you happy and healthy. Call us today at (623) 776-0206. Exercise naturally burns off excessive cortisol – your stress hormone. Physical activity releases your feel-good endorphins that will enhance your overall sense of well-being. Try walking, jogging, biking, gardening or swimming—anything to get you moving and stay active will help to fight off any stressors from your day. It takes no more than a ten-minute walk each morning or evening to start making a big difference. Not getting enough sleep? If you aren’t catching enough z’s it could be leaving you irritable and on the edge. After losing just a few hours of sleep, it can increase feelings of stress, anger and sadness. Try to get at least 7-9 hours of sleep each night. Sleep is the best anti-inflammatory we know for your brain and body. We detoxify, regenerate neurotransmitters, heal and repair during deep sleep. Do you really want to miss out on this? If you aren’t getting quality, deep, uninterrupted deep sleep, ask for a no cost consult with one of our experienced Doctors at Renovare so you can get to the root causes – and sleep great! EFT is a drug-free, safe, and effective way to help you let go of the subconscious “triggers” for your stress and sleep problems. A wonderful approach to help get at the root causes of your toxic stress response. This empowers you to change your emotional state from stress to peaceful, relaxation. Clinical Hypnotherapy helps you think about your stress as a reaction to an event so that you can easily identify how to manage it. You may not be able to control all of the things that can cause stress, but you can control your response to them. Brain Mapping allows us to see your brain in action. By evaluating your brain wave activity and balance, we can see the patterns resulting in your stress and anxiety problems to help guide a “Brain Balancing” Neurofeedback program. This approach has shown the most promising results of anything I have used in over 30 years of practice. Social contact is a good stress reliever since it offers distraction and provides support. If you are feeling stressed out, don’t hide away in your bedroom—instead reach out to family and friends. Cultivating social networks of friends and family will help your mental and physical health. Eat to energize your brain so that it works well. Your brain is made of 70% fat so getting enough healthy fats like Olive Oil, Fish Oils, Avocados, Nut butters, Coconut Oil, and Ghee is essential. Foods that fight stress include blueberries, salmon and almonds. Tired of feeling stressed? Don’t battle stress alone. Consult with your doctor to find ways to discover how to beat stress and help you lead a healthier, happier life. Call us today at (623) 776-0206. 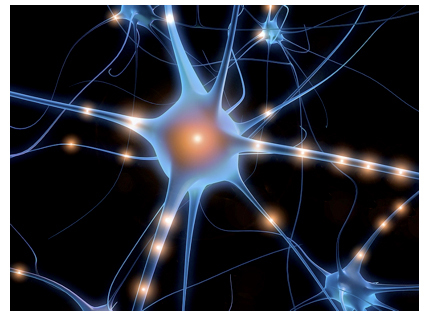 How soon will I notice the changes from neurofeedback? What conditions can you help with? I’ve had my pain for 10 years. Can you help with that? Does chiropractic work for/help children? I’ve heard once your start chiropractic you have to go for the rest of your life. Is that true? What is that popping sound when the neck is adjusted? Do I have a damaged disc? I think I have a pinched nerve. Can you help me? Is it bad to crack my own back or neck? Do I need to see my MD before coming to a chiropractor? I really don’t need a chiropractor because I don’t have back issues, right? Is it okay to see a chiropractor is I am pregnant? I heard that I’ll have to have chiropractic for the rest of my life once I start. Is that true? What’s the difference between an osteopath and a chiropractor? It seems that they both do adjustments. Are their side effects from chiropractic? Can chiropractic help me prevent pain in the future? Do I have to exercise if I get chiropractic adjustments? How would I know if my child needs chiropractic? Are all patients adjusted the very same way? What is a typical treatment in your office? Should I use ice or heat at home? Do I need to continue chiropractic once my pain is gone? Do chiropractors prescribe drugs or surgeries? Can I get my lab test for my Vitamin D levels from a chiropractor? I had a head injury. Do chiropractors only treat backs? I’ve had migraine headaches since I was a child. I heard that chiropractic could possibly help. Is that true? What’s the purpose of a chiropractic adjustment? Besides pain relief what are some of the other benefits I might receive from chiropractic adjustments? Can I become addicted to chiropractic adjustments? Why did you choose to be a chiropractor? Will adjustments weaken my spine? I have arthritis. Won’t chiropractic make that worse? Can a chiropractor write prescriptions for medications? Will I be sore after my adjustment? Do you accept my Flex Card Plan? What’s the best pillow to use? What’s the best mattress to use? Will you give me exercises? What is the training of a chiropractor? I need help with my nutrition. Do you provide that? I want to lose weight. How can you help me with that? Can the bones be moved too much or too often? Will a subluxation clear up on its own with time? If I have osteoporosis can I receive chiropractic? What is cold laser therapy and how can it help me? What is WHATEVER MODALITY and how can it help me? What are the most important supplements for me to take? What supplement will help reduce my pain? What supplement will help reduce my inflammation? Can chiropractic help with my foot pain? So what really causes the discs in your spine to degenerated and bulge? The outdated view is “old age”. If this were true, wouldn’t you expect all of your discs to succumb to “old age” together? Instead, we typically find one or more areas of localized disc degeneration and other adjacent areas of the same age with little or no degeneration. Why? The scientific reference journal, Arthritis Research and Therapy volume 5, page 120-130 states: “One of the primary causes of disc degeneration is thought to be failure of the nutrient supply to the disc cells . Like all cell types, the cells of the disc require nutrients such as glucose and oxygen to remain alive and active. In vitro, the activity of disc cells is very sensitive to extracellular oxygen and pH, with matrix synthesis rates falling steeply at acidic pH and at low oxygen concentrations [66,67], and the cells do not survive prolonged exposure to low pH or glucose concentrations . A fall in nutrient supply that leads to a lowering of oxygen tension or of pH (arising from raised lactic acid concentrations) could thus affect the ability of disc cells to synthesize and maintain the disc’s extracellular matrix and could ultimately lead to disc degeneration. So why do I suffer from a degenerated, bulging disc? The cerebellum (part of your brain) controls ALL of the spinal postural muscles, when the cerebellum is not neurologically firing properly, the spinal muscles spasm and the vertebrae lock up causing disc bulge and degeneration. The only way the disc gets nutrients is through motion. Therefore, no motion = disc degeneration which will eventually be a bulging or herniated disc. What else causes disc degeneration? Too much damage and not enough repair. Too much damage is typically from excessive inflammation like rust on metal, inflammation destroys discs. Posture, foot, and hip biomechanical problems cause microtrauma. Foot problems, hip problems, dropped arches, a short leg can lead to destructive spinal twisting and shearing forces that damage our discs. Proper disc nutrition. Most Americans are deficient in multiple critical nutrients including bio-available amino acids, zinc, magnesium, Vitamin C, Vitamin D, and essential fatty acids. These are critical to reduce inflammation and supply what is needed for disc repair. Proper joint movement. After age 18, there is no longer blood supply to our discs. They depend on a pumping movement like a sponge to move nutrients in and toxins out of our living discs. This critical pumping movement depends on flexible joints, muscles, and an active lifestyle. Proper nerve supply. Movement depends on muscle and muscles are controlled by your brain and nervous system. This must be in a delicate balance for the joints and discs to move just right – not too little and not too much. “7 Secrets to Wellness” available at Amazon and at Renovare Wellness By Design helps to explain this better with easy-to-read color graphics and stories. In summary, these is Hope for Healing for those suffering with disc degeneration. By dealing with the root causes of your problems using our unique integrated whole person care approach (page XII of the Intro), it is rare that people do not achieve significant relief and a return to an active lifestyle free of pain. We Care For Your Nerves! They’re the fibers that help you feel, think, and move. The messaging system that transfers signals throughout your body. And you have other nerves – the ones that keep you calm in the face of chaos, focused when life throws you a curveball, and courageous when calamity strikes. At Renovare we care about all of your nerves – mind and body. We have the training, experience, and tools to help balance your ALL of your nerves – from your brain to your feet – and everything between. So whether you suffer from pain or insomnia, anxiety or the blues, fatigue or memory loss, there is Hope for Healing – Naturally! We want financial security – the peace of mind knowing we will always have the resources we need for what is important. We want to know we have enough savings for a comfortable retirement. How do we invest wisely to best accomplish this? Along with saving and investing wisely, it is essential that we avoid the “financial disasters” that can bankrupt us and erase our savings and investments. So what is the #1 cause of bankruptcy in America? Data from the U.S. Census, Centers for Disease Control, the federal court system and the Commonwealth Fund as reported on CNBC shows that bankruptcies resulting from unpaid medical bills will affect nearly 2 million people this year—making health care the No. 1 cause of such filings, and outpacing bankruptcies due to credit-card bills or unpaid mortgages, according to new data. And even having health insurance doesn’t buffer consumers against financial hardship. So how do we protect against the #1 cause of bankruptcy and financial ruin in America? How do we invest to best insure our quality of life – now and into our retirement years? Wellness is much more than the absence of pain or symptoms – Wellness is your best insurance against financial and health catastrophes. Dentistry has taught us that waiting for tooth pain is a terrible way to enjoy dental health for a lifetime. Imagine only brushing or getting dental cleanings when your teeth start to hurt? 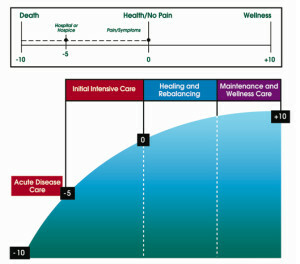 The diagram on the back side of the page shows the difference between absence of pain (the 0 point) and Wellness (+10). 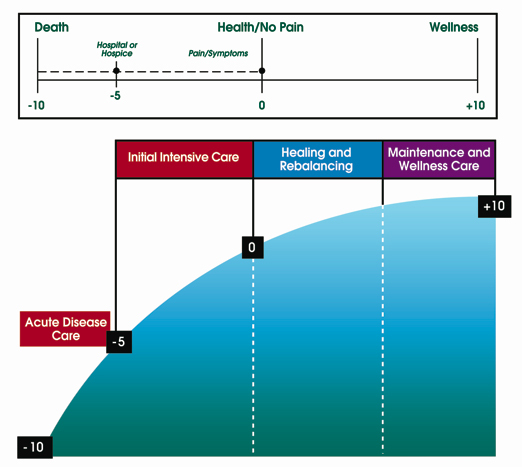 As you can see, Wellness at +10 on the graph, is a long ways from 0 – and even further from the negative side of the graph where pain, suffering, loss of quality life and insanely expensive medical bills can overwhelm us. It is interesting that America spends more money on health care (really disease management care) than any other country in the history of our planet according to Michael E. Porter, the eminent Harvard business professor who earlier helped develop the Global Competitiveness Report as reported on CNN and in the New York Times. So we spend the most ever on health care – this means we must be Number 1 in the Health and Wellness ranking – right? Wrong. Number 1 is Japan, number 2 is Switzerland, number 3 is Italy. America is below every other western nation down at an abysmal number 70 !!! How can we spend so much and get so pitifully little in results? America does a great job with crisis care – think TV shows like ER. However, over 80% of our health needs are now chronic disease care rather than crisis acute care. We use the same expensive high tech approaches and drugs that work for acute care for chronic disease – with poor results. Instead of the disease management focus of treating symptoms, we need to move to the deeper level of finding and treating the root causes. Our popular book, “7 Secrets to Wellness” is a roadmap to investing in your Wellness, finding root causes, and enjoying your “best investment” of personal and family high level Wellness. Ask for a complimentary consult with one of our experienced Doctors or call us at 623-776- 0206 to learn more – and invest wisely. Why do we do what we don’t want to do and do what we know is harmful to us? The following 2 videos do an excellent job of explaining why and what to do about it. We assume that people need information to change. They are sick, fat, and getting old fast. They are addicted to caffeine, nicotine, sugar, and gluten. We tell them to change. How well does this work? What is needed to make change? A balanced brain. To an unbalanced brain, our recommendations are just words – with no emotional impact. Remember, we are emotional beings with the ability to rationalize. We make decisions based on emotion (what “feels” good) and then look for reasons to back up our decision. A balanced frontal cortex which regulates planning, self-control, and inhibition. Someone with ADHS has a low active frontal cortex so their self-control is poor and they come across as impulsive, with poor decision-making and often “act-out” inappropriately. Asking this person to reduce their sugar/soda/junk food is like speaking Greek to a log – it does not register. Must increase the activity of the frontal cortex first through Neurofeedback, FSM, PMT, Laser etc. An overactive Amygdala inhibits the frontal cortex (they are directly connected) resulting in the same kind of decreased inhibition and control. Excessive testosterone, and other hormone imbalances can do this as well as many other factors. Asking this person to “calm down” their excessive emotional response is again speaking Greek to a log – they cannot receive, process, understand, or act on your message. In summary, you need a balanced brain to create balanced emotions to allow and support healthy decisions – esp. healthy LifeStyle choices. Can’t convince or dump info to persuade someone if their brain is imbalanced. This is why it takes SO LONG ( if ever) for some to make healthier choices. Effective training. Practical how-to training and coaching is essential to make effective change. Social Proof – we need to see other people doing a healthy LifeStyle if we are to change. Our brain is programmed to “copy-cat” what we see. Our Celebrate Natural Foods fest is one example. How do we do more to offer living examples of the LifeStyle changes we teach? Maybe more pictures of us and our families interspersed in PowerPoint presentations? What else? Great nutrition – brain will not balance or stay balanced without. Think Core 4, Wheat and dairy free, lots of healthy fats, veggies, and protein. Great Sleep – essential for brain rewiring and healing. Great exercise – essential for brain to work right. We hear this question from our patients over and over. How do we answer? For those who have slipped to -5 or below, the healing/getting Well process is obviously much longer than those who are just below 0. How complicated is their chronic disease picture? Those with complex chronic disease who have a long-list of conditions like Type 2 Diabetes, Insulin resistance, Autoimmune disease, Leaky Gut, Maldigestion/Malabsorption, Neurodegenerative disease, Sleep Disorders, Sleep Apnea, Autoimmune disease, and Chronic Pain, have a longer and more difficult healing journey than those with just one chronic condition. Our age. When younger, we heal faster. As we get older, we heal slower. This is especially an issue for those with accelerated biologic aging and excessive inflammation whose biologic or functional age far exceeds their chronologic age or number of birthdays. Our genetic uniqueness. Some have a stronger genetic constitution and heal faster and easier than others. Our LifeStyle. Some have lived a hard life of drug use (prescribed or recreational), junk-food, sleep deprivation, addiction, and excessive toxic stress and have damaged their ability to heal and respond to a natural care approach. Their LifeStyle has resulted in excessive DNA damage that overwhelms our DNA repair capacity. The adverse LifeStyle and environment results in epigenetic changes that alter gene expression to create dis-ease. This can be altered through optimal LifeStyle choices over years – we didn’t create our epigenetic “software” problems overnight. Our Metabolism/Mitochondria/Body Cell Mass. Those with healthy metabolism, efficient and youthful mitochondrial cellular energy production and lots of muscle/organ mass with very little inflammation-producing VAT (visceral adipose tissue) or belly fat heal faster. They have the energy to heal and repair. When our mitochondria are optimum, we produce our body weight in ATP to power our body functions. When our mitochondria don’t have what they need to operate at optimum or are damaged, they produce too little ATP and too many free radicals. We feel tired, inflamed, and fat.We get a new body every 5-10 years depending on the tissue and patient age. The heart cardiomyocytes replaced every 3 months , our digestive lining replaced every 5 days, and our liver is replaced every 300 – 500 days.Then why don’t we get a perfect, new body every 5-10 years?Because the most a cell can repair in one cell division is limited. We don’t get a perfect, new cell with mitotic cell division – we get a duplicate of the parent cell with the same DNA damage and epigenetic markers. While DNA repair occurs, it is limited and lessens as we age, make poor LifeStyle choices, gain weight as body fat – esp. VAT (visceral adipose tissue), and experience mitochondrial damage. 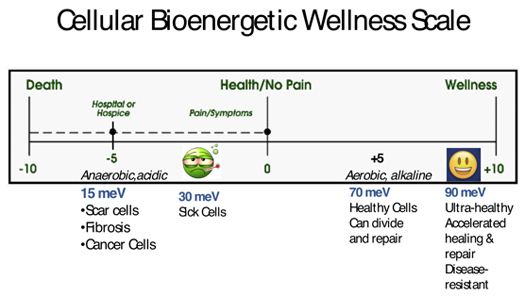 As a result, it takes many cell divisions under favorable LifeStyle/environmental conditions to result in significant improvements in cellular and tissue Wellness. The journey to high-level Wellness takes years for most with complex, chronic disease. In my practice, patients keep improving for 4-5 years commonly before they plateau at their maximum achievable level of Wellness. Of course, not everyone is willing to invest the time, energy, effort, change, and finances to achieve their optimum. For those that do, the transformation is life-changing and for many life-saving. Our digestive tract integrity. Those with advanced Leaky Gut and microvilli destruction as seen in those highly gluten-intolerant who have been undiagnosed for more than 5 years have a much more difficult and slow journey to Wellness. Nervous System balance and function. Those who have had life-long routine Chiropractic spinal adjusting seem to respond faster than those who have not. Those with balanced brain and central nervous system function respond faster than those who don’t. Effective, restorative sleep. Getting Well and staying Well is impossible without enough quality sleep. Sleep deprivation(not enough hours of sleep), poor quality of sleep(not enough uninterrupted time in each of sleep stages), and sleep apnea (oxygen deprivation during sleep) result in excessive inflammation, impaired healing and detoxification, and neurotransmitter depletion. Eating Smart. Food is information. It is essential that what we eat fits our unique genetic needs to optimize our healing and recovery. In my experience, each patient I see suffering with chronic health conditions is gluten and dairy reactive/intolerant until proven otherwise. The delayed IgG and IgA food allergies especially concern me in that they are typically hidden to the patient and can contribute to virtually any symptom often with a 1-3 day time delay. We are using US Biotech for cost effective reproducible IgG and IgA Food Allergy testing. Vitamin D and K-2 (I use a combo product since whenever we exceed 5000 IU Vit D and start to raise serum calcium levels, we want the calcium directed into our bones and teeth, not into calcifying arteries and soft tissues. Vitamin K-2 (MK-7 version) works best for this. I use 200 mcg K-2(MK7) per 5000 IU of Vitamin D-3. I use the 25-OH Vitamin D-3 blood test from LabCorp to monitor. Ideal is typically 75-150 ng/ml unless patient develops Vitamin D overload. This is determined not by an elevated 25-OH Vitamin D-3 level, but rather by an elevate serum calcium level (over 10). Magnesium. Virtually everyone needs more magnesium and struggles to maintain levels since with stress we waste magnesium through urination. I like a combo of high absorption magnesium glycinate with taurine to boost magnesium retention. Therapeutic levels of magnesium need to be taken away from meals with fat. I live first AM and before bedtime working up to bowel tolerance. Effective stress management is also important. Exercising Smart. Not too little and not too much. Most need emphasis on strength building especially core. I emphasize interval cardio training of shorter durations. Effective detoxification – emotionally. We have a skilled Emotional Release Therapist as part of our healing team as well as a Clinical Hypnotherapist. Subconscious emotional dysfunction and negative patterns frequently sabotage our best efforts unless we assist our patients in releasing them. 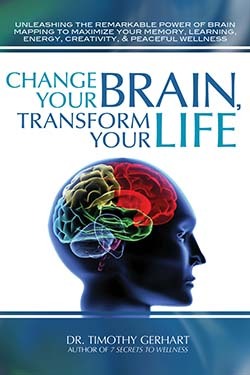 We are adding BrainMaster Brain Imaging and NeuroFeedback training as a further tool to “Change your mind, change your Life”. Effective detoxification – heavy metals and toxic chemicals and endotoxins. 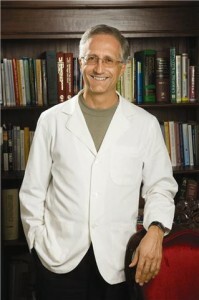 I have learned that the more toxic my patient, the more hypersensitive they are to chemicals, foods, treatments, etc. Foundational is supporting the healing of their “Leaky Gut” and improving their food choices. We often run the Doctor’s Data post DMSA challenge urine heavy metal testing. I am often surprised by high lead levels. This appears due to low Vitamin D levels in the past which creates lower calcium levels and higher lead absorption. Burning coal world-wide to make electricity has released huge amounts of lead into the global environment – we all live downwind. Along with oral EDTA, DMSA products, I have found S-acetyl Glutathione effective in raising blood and tissue levels of glutathione comparable to IV therapy without the needle or cost. Xymogen is the supplier for us on this product.If you would like to learn more, I wrote the book: “7 Secrets to Wellness” available on Amazon. Our website at: www.wellnessbydesignpro.com has a link on the cover page to the Amazon book purchase page. Timothy C. Gerhart, D.C., D.A.B.C.I., Dipl. Ac. I am a Board-certified Chiropractic Internist and Chiropractic Physician utilizing a natural LifeStyle-based approach that works to help each patient reach their individual goals. Frequency Specific Microcurrent (FSM) and the lastest Class 4 Laser therapies to boost healing and reduce pain and inflammation. A National Merit Scholar at the University of North Dakota and graduated at the top of my class from Northwestern University of Health Sciences in 1983. A registered acupuncturist with extensive training and experience in bioelectric testing and treatment. Diplomate status (highest level of training) with the International Academy of Medical Acupuncture. Wrote and taught the post-graduate course in Laboratory Diagnostics for the American Board of Chiropractic Internists through National University of Health Sciences. Member of the American Chiropractic Association Council on Diagnosis and Internal Disorders. My staff and I have been helping patients since 1983 – 21 years in Minnesota and the past 12 years in Arizona.